The lovely and quite festive-if-you-want-it-to-be tangle Trimond (not to be confused with Trimonds) comes to us from West Virginia tangler Beth Snoderly. 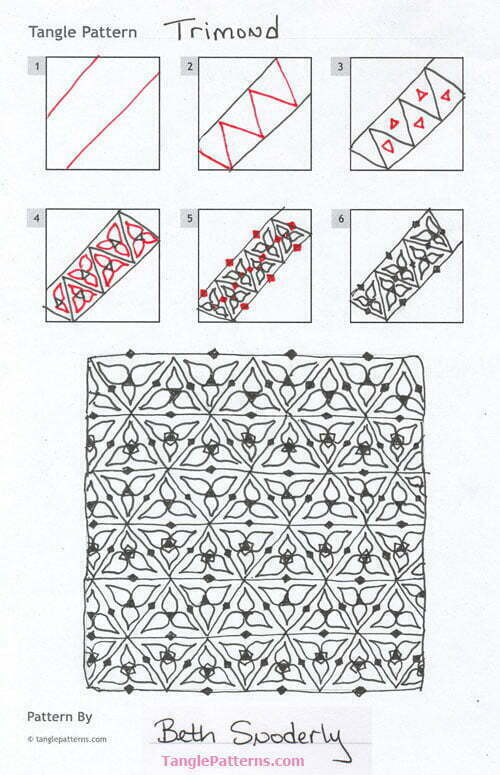 Beth has shared several great tangle patterns and strings with the Zentangle® community here on TanglePatterns. You can locate them all by searching for her last name in the “Search TanglePatterns” box at the top right of the page. As is usually the case with most tangles, it helps to turn your tile as you are drawing so your hand is in the most comfortable position for repeating the same stroke. I found this particularly useful for me in Step 4 below. Beth illustrates the step-by-step instructions for drawing Trimond below. She shows it here in a border or ribbon-style version as well as a grid-based monotangle with a pretty variation in alternating rows. This is a tangle that I will try, its fun and nice and easy, thanks for sharing. What a great tangle, thanks for sharing! Thanks so much everyone! I just love sharing! It’s such a lovely touch of whimsy. Very light and airy feeling, feminine. Thanks for sharing.